Coast Defense is an excellent twist on your typical castle defense style games. Similarly to other castle defense games you have one base that you must defend. However, in this game you are in a dugout to the side of the invading army and you “pick ‘em off” one by one as they run across towards your base which is to the right of the screen. In a way, it reminds me of Normandy, however here we’ve got soldiers, jeeps, tanks, personnel carriers and helicopters that are trying to get to your base and destroy it. You are in a bunker to the side of the invading army. As they enter the battlefield you pick them off one at a time, or depending on your chosen weapon you can get more than one. To the right is your base, which you must keep the invading army from reaching. If they reach your base they will open fire and your base’s health will decline quickly. Each wave of attacks gets stronger and harder to kill. 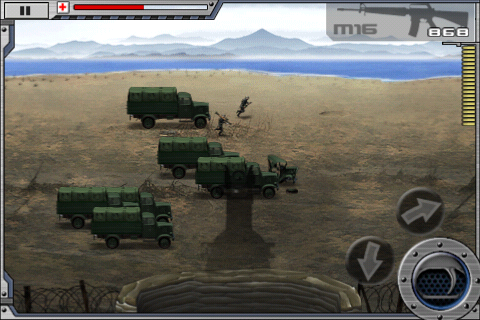 So, in the first wave it’s just soldiers, then they add jeeps (?) then personnel carriers and so forth. Once you get into the high teens the waves have a lot of everything and you must be fast with your weapons and accurate with your shots. If you get overburdened with a particular wave you can call in an aerial bomb drop, providing you’ve purchased it prior to needing it. Or if you’re really in trouble then there’s a nuke that you can drop on the battleground (once again, providing you’ve purchased it). At the end of each wave you have the change to upgrade your base and buy new weapons and ammo. Some of the guns are not worth buying and I found that going straight to the M16 then to the M-60 worked best. While some of the other guns are more accurate, it’s the rate of fire that matters most when you have several vehicles and soldiers running across the battlefield towards your base, trying to destroy it. Not to mention, shooting the M-60 in full auto mode is just more fun than a sniper gun, but that’s just me. I really like Coast Defense. The game provides excellent castle defense style gameplay but with some minor twists. Couple the cool gameplay with the $0.99 price point and Coast Defense is an easy recommendation, especially if you like castle defense or war style games. What we liked: Gameplay was great!, fun and addicting. What we didn’t like: Nothing, really. love this game but i cant figure out the points system. do you know how the points are scored? I keep thinking I’ll finish in the top but I’m always short.